Contemporary flamenco dance by Kasandra "La China" with rapid-fire footwork to Davide Sampaolo on cajon. Haunting dance solo by Andrea Williams, with the beautifully embroidered fringed shawls called "Manton de Manila" with Chinese pattern. Flamenco fusion with bellydance with ghostly white flowing fan veils and silk scarves. Graceful classical Spanish dance with castanets juxtaposed with modern flamenco piano. Three Sides of a Coin presents the multifaceted nature of a Woman. 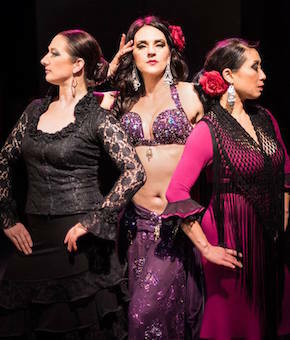 It takes the raw passion and drive of Flamenco Dance performed by Andrea Williams & Kasandra "La China", and contrasts it with the soft, sensuous seductive nature of Oriental Bellydance by Ashley Kirkham. It also compares the yin and yang, female and male energy with the bravado and athleticism of Joel Hanna, power of Italian cajon player Davide Sampaolo and rhythm of darbouka player Tim Gerwing. The vibrant show celebrates passion, virtuosity and expression, through the rhythm of world percussion, Spanish castanets and Eastern zills and of course, rapid-fire footwork! Each dance is carefully crafted, individually coloured and brilliantly conceived. The beauty and power of the dance results in a dazzling, innovative presentation of an impressive array of cultural, musical and aesthetic influences. The audience is left spellbound with the magical imagery of fluttery fans, Chinese silk veils, Sevillan shawls, flamenco ruffles and fiery footwork. Three Sides of a Coin pushes the boundaries of flamenco in new, innovative directions, infusing classic forms with unexpected influences such as jazz, pop, Latin, Cuban & Chinese rhythms. Blending world percussion with dance artistry of some of the best dancers in the world. This unique performance promises to transport audiences to a magical, imaginative place anything can happen! Kasandra "La China" (flamenco dancer) is a Canada Arts Council and BC Arts Council Recipient who is one of Canada’s top female dancers known for her unrelenting drive to push the artistic envelope. She runs the Mozaico Dance Academy in Vancouver and tours with her flamenco group the Kasandra Flamenco Ensemble. Andrea Williams (flamenco dancer) is the artistic director and founder of the contemporary Raices y Alas series of projects which continue to show the evolution of flamenco in continual sold out shows. She is also a Canada Arts Council recipient. Ashley Kirkham (Oriental dance) is a professional dancer and instructor who is a rising star in the Oriental dance world, winning multiple international competitions. She has a few dance companies, notably Samar Oriental Dance Ensemble. Joel Hanna (Irish Tap) is a world renowned dancer and choreographer who has toured the world extensively, including being a featured performer in Riverdance. Davide Sampaolo (flamenco & afro-cuban percussion) is from Rome and has studied and travelled extensively studying flamenco and Cuban folklore. He is a featured member of the Kasandra Flamenco Ensemble. Tim Gerwing (Middle Eastern Drummer) Gerwing is sometimes described as a musical "Renaissance Man." A true musical generalist. He has been a fixture with Gord Grdina’s Haram for many years, and is a core member of the Samar Oriental Dance Ensemble. Waseem Sbait (Middle Eastern Drummer) Although he comes from a jazz trombonist background, Waseem found his passion in Egyptian drumming.